Every year, millions of sun-starved tourists head to Portugal’s beautiful Algarve coastline to soak up some rays, catch the surf and indulge in the local seafood. But where do you go if you want to avoid the masses? Who better to ask than four of the web’s leading insiders on travel in Portugal. They’ve been kind enough to share their favourite ‘secret beaches’ with Travel Edits. 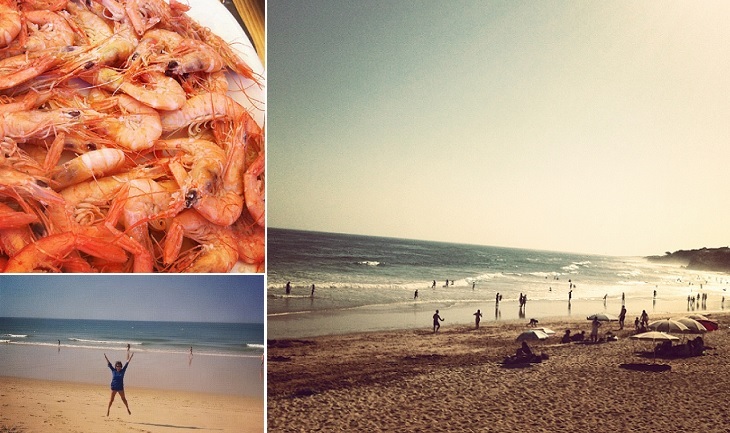 Salema Beach: Our favorite Algarve beach is Salema. It is off the beaten path, a long strip of sand adorned by turquoise water. We love to walk on the sand during low tide, watching the fishing boats and looking for seashells. Or to sit in a rustic coffee shop by the sea, reading a book, cooled by the perfect breeze. We greatly enjoy dining at Boia restaurant, which is right on the beach. The Algarve has some of the very best fish in the world and the chef at Boia grills it perfectly. We can’t help thinking that in Tokyo this fish would cost a fortune. But here this amazing fish goes for a very modest price. Pair it with a great local wine and the spectacular sunset and the experience is unforgettable. Sometimes in winter, when it’s cold and dreary, we dream of a perfect summer day at Salema and feel a sudden jolt of happiness. By Bus: Buses operate from Lisbon and Faro. These regional buses travel as far as Lagos and then it is necessary to switch to a local bus. There are two options on the timetable, Salema X and Salema. Take the Salema route only, as Salema X will leave you 1.5km away. Full bus schedules are available at www.eva-bus.com and www.rede-expressos.pt. By Car: Try renting a car in Faro airport, book ahead online with a company such as ArgusCarHire.com. Salema is located halfway between Sagres and Lagos and is accessible via the N125. Praia da Ingrina: I found Praia da Ingrina by accident when I made a detour on my way to Sagres on the EN125. A brown sign at Raposeira encouraged to turn left but I had no idea there would be a small, sheltered cove at the end of the road. It was a warm April day so the beach was deserted except for a guy in a wetsuit. Even in the height of summer, this is one of the less crowded spots in the Algarve. As well as a small, sandy beach, there are plenty of rock pools to explore and it’s also possible to hire kayaks or go paddle boarding if you need to do more than sit back and relax or go for a swim. Restaurante do Sebastião is the only restaurant at this beach and serves reasonably priced meals and snacks under the shade of palm trees. Praia da Ingrina is easily reached – simply follow the signposts from the traffic lights at Raposeira, on the road to Sagres. A short, 4km drive takes you through scenic countryside also past some interesting ancient ‘standing stones’. A car park is located on the opposite side of the beach. 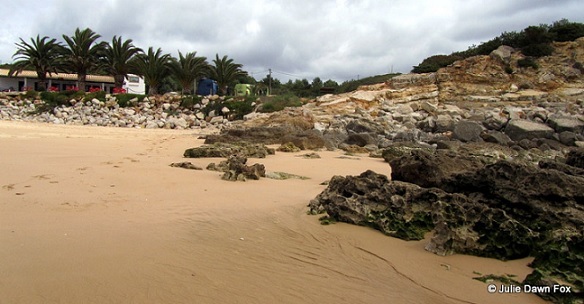 Visitors should take care while walking to Praia da Ingrina as it is not considered an “accessible beach”. There are no boarded pathways and there are no steps to the beach from the road – definitely off the beaten track, but worth it. Pine Cliffs Beach: My favourite beach in the Algarve is not totally secret – but to be fair, not accessible to all. In Albufeira’s massive Falesia Beach, every July you will find me at the Pine Cliffs beach by the Sheraton Hotel. It can be so quiet early and late in the day, that it is perfect for my now trademark star jumps. I love Portugal’s beaches because they have great facilities – sun loungers mostly! By walking 300m away from the hotel, you will find “O golfinho”, a beach restaurant which serves the nearby Barranco da Belharuca beach (which offers public access). There you can eat some lovely freshly grilled fish and wine white sangria for around €20 per person. Add a gin & tonic or a caipirinha when the sun sets and you have a pretty perfect day. If travelling from Faro, take the A22 motorway direction “Oeste Norte/Lisboa. Leave at exit no 2 in the direction of Boliqueime. Next, follow the N270 towards Poco de Boliqueime. When you arrive at the traffic lights, turn to the left onto the EN125 road in the direction of Faro. Follow the EN125 until you reach the end of the village of Maritenda. Turn to the right after 800m towards Albufeira. You will then see signs for Sheraton Algarve/Pine Cliffs Resort. Armona Island: As a child I would always go to the western Algarve, where my grandfather was from. But given the huge build up in some of those parts, I always head to the Eastern Algarve now, which has kept some truly unspoilt beaches. One of my favourite beaches in the region is the beach of the island of Armona, as it involves boarding a ferry, a fun half hour boat ride and a bit of walking before arriving to a beautiful stretch of a golden sandy beach. You can decide to stay with the few people visiting the beach, mostly families, or walk a bit further to enjoy a quiet and almost deserted beach. A silence only to be interrupted by the fishing ships. Plus you can do some activities besides swimming, like catching your own lunch by picking the small “conquilhas” (a type of shellfish) from the sand, in the low tide. If you don’t get them don’t worry: there are plenty of them in the nearest restaurants! Some people avoid the wonderful islands of the Ria Formosa, because of having to take a ferry or a small boat to get to the beach. I think that is exactly part of the fun and charm of these beaches. A ferry runs from Olhao every hour during the high season. Water taxis are another option – the typical journey takes just 5 minutes. A huge thank you again to our experts for revealing these hidden gems. Now just promise not to tell too many people! Now I REALLY want to go back to the Algarve!! There are some pretty spectacular beaches there! Wouldn’t mind sneaking away to any one of them! It’s actually surprising how they’ve remained a secret for so long! Been reading/seeing so much of Portugal lately! A sign that I need to get there ASAP?? Take me to the beach! Any of these will do just fine! I guess Portugal is the place to be! And a gin and tonic at sun set to top off a gorgeous day? Not a bad idea! Seriously.. I think you and Mrs. O are teaming up on me. I’m itching to go visit Portugal! And so I’m reading yet another wonderful Portugal post. I WILL get there this year. Promise! Great post and lovely beaches. A visit is well overdue Leah! Best people for the job, Raul! Why have I never been to Portugal yet? Seriously, I need to just get there asap. Great guide for off the beaten path beaches. Makes me want to beat a path to get there ASAP. I am sure if Mrs. O approves, it must be a quality beach. 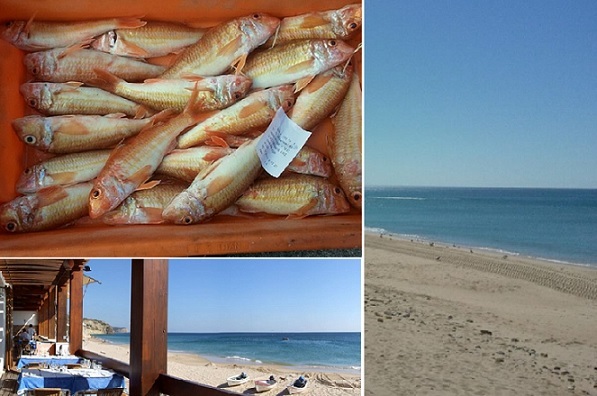 You have to try “Praia da Fabrica” in Cacela Velha and “Praia do Estreito” In Santa Luzia. Originally from the Algarve, I would say that some corners over there still unexplored just because they’re not as much touristic as Albufeira, Alvor, Praia da Rocha and Quarteira. 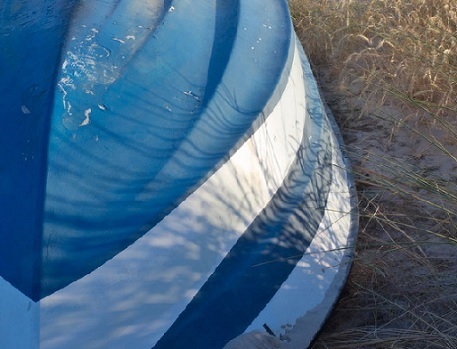 Some of these unexplored beaches have difficult access. What about Praia de Odeceixe? Great for surfers! Next time you have to visit us! Love Vila Real de Santo Antonio beach – quiet and uncrowded. Carrega Algarve. i will make note of these places n visit while am there, tell you all what i think when i get home, cause i know some wonderful beaches n quiet places to visi, if you want quiet. have been visiting Portugal for many years, have travelled from north to south. its all a wonderful country and the people are so nice.